With the exception of this past year (when I was extremely pregnant), we always practice the same traditions at Christmas. I've spent 26 of my 30 Christmases waking up in my childhood home, yet Easter is always a bit random. Probably not as random as spending Thanksgiving in Las Vegas several years in a row, but every year seems to be a different story. I've spent Eater with my family in Northern Cali, at my aunt's house in Monterey, with just my husband while my parents were away, in Vancouver with just my brother - you get the idea. This Easter will be the first major holiday we will be spending with our baby boy. Not only will it be the perfect opportunity to dress him all up in pastel plaids, but a time to start some new traditions. One easy way to introduce a new tradition is with food. Ginger crinkles at Christmas and pumpkin pie at Thanksgiving - it is about time Easter in our household has its own set of treats to help recall moments of such a special holiday. Certain smells and tastes bring back memories in an instant. Perhaps it will be the scent of cinnamon and other spices being baked up in these Carrot Cupcakes that my children will associate Easter with one day. If I am being 100% honest here (which I generally try to be), then I will admit that this recipe started out as a side dish to some baked teriyaki salmon. I've always cooked carrots with a touch of brown sugar or maple syrup. On a whim a few weeks ago, I tossed in a spoonful of white miso paste to the mix to pump up the flavor. And boy did that do it! The salty miso mixed with maple and natural sweetness of the carrots created the most delicious savory/sweet combination a vegetable has ever seen. 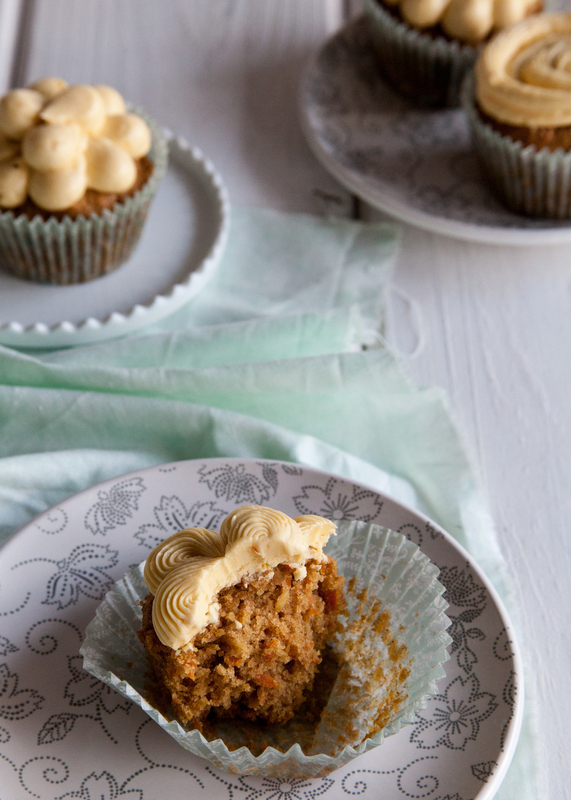 Since it worked on carrots, I thought - why not with carrot cupcakes? I imagined it could go one of two ways - either a strange, salty combination that would be reminiscent of a sushi cupcake or a complex, perfectly balanced salt/sweet treat. I am glad it was the latter. The carrot cupcakes are a riff off my classic carrot cake - but with half wheat flour, half coconut oil, and half coconut sugar. I threw in some oats and a touch of ginger as well. While the cupcakes themselves ended up closer to something in the muffin family, I certainly was not missing the extra oil and sweetness once they were iced in the rich, flavourful buttercream. To make things a bit more decadent, I started with a French Buttercream. Using egg yolks, real maple syrup, and real butter, this buttercream is almost too sinful for Easter. The added white miso balanced out some of the sweetness and added the perfect amount of unexpected savouriness. Add in the miso according to taste. There should be a pleasant, salty taste at the end of each bite. Preheat oven to 350 degrees. Line a cupcake pan and set aside. In a large mixing bowl or in the bowl of an electric mixer, mix together the oils and sugars. In two batches, stir in the dry ingredients until combined. Fold in the carrots and oats. Evenly distribute into the cupcake liners and bake for about 20-23 minutes or until done. For the buttercream, place the yolks in the bowl of an electric mixer. Beat on high with the whisk attachment until they double in volume and are pale in color - about 5 minutes. Meanwhile, place the maple syrup, sugar, and water in a saucepan. Heat over high until mixture reaches 238 degrees on a candy thermometer. Once the sugar mixture is hot, remove from heat and let stand for about 30 seconds. With the mixer on low, carefully pour in the sugar mixture into the egg yolks. Slowly bring the speed up to high and mix until the outside of the mixing bowl returns to room temperature. Stop the mixer and swap out the whisk for the paddle attachment. Add in the butter, a couple tablespoons at a time, until smooth and creamy. Meanwhile, mix the miso with a teaspoon or so of hot water to dissolve slightly. Add in the miso mixture - according to taste. Frost cooled cupcakes with the maple miso frosting.